It seems winemakers have as many words for ‘pruning’ as Eskimos have for ‘snow’. I was keen to try my hand, really I was, but after the demo I was severely concerned that a snip to revitalise growth might instead cause an accidental vine-vasectomy. It didn’t help that the crowd gathered to partake in the pruning lesson were a) a little tipsy from the rosé on arrival and b) utterly smitten by the demonstrator. I could understand why – Sebastian Beaumont, standing bashful-but-happy amongst the vines he has known since childhood, is one of those instantly warm characters with whom you long to be best buddies. Everyone wanted a piece of him, and he handled a barrage of questions and good-natured heckling with sound knowledge and graceful humour. I was in Bot River to experience a Barrel Cellar Lunch with Beaumont Wines. Lunches with winemakers are an increasingly popular way to encourage loyalty to a brand and they offer to the punter a novel way to experience South African hospitality with added interest. For such a lunch to occur on the wine farm itself is an experience not to be missed, especially when it offers a little insight, as in this case, in vine husbandry. The Beaumont Family have been established for nearly four decades at the farm lying alongside the village centre of Bot River. It’s not a busy corner of the world. In fact it’s the sort of place where one has to wake up the petrol pump attendant. The centre of activity – and in fact the reason Bot River was established – is the train station. During the whole weekend we saw a grand total of one train passing through. The farmstead of Beaumont Wines is a far cry from the immaculate, manicured grounds of many wine estates on the more standard tour. This is proudly a working farm with a beauty that comes from the owners’ genuine love for the place rather than any need to impress visitors. Great swathes of land are left fallow to encourage biodiversity (a popular theme in an area that forms part of the Green Mountain Eco Route) and as a result the insect and birdlife are exceptional. We even saw buck amongst the vines. And all this culminated in The Lunch. 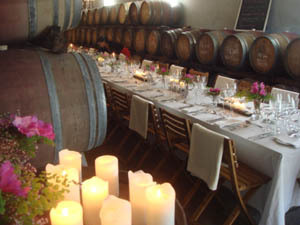 From the vineyard the group of 50 paying guests moved into the barrel cellar where a single long table was laid with heavy white table cloths, candles and delightfully simple vases of delicate-but-wild foliage. I was honoured to be sitting near the matriarch of the family, Jayne Beaumont – artist, gardener, and warm-hearted hostess of a table packed with interesting characters. I met a wine trader, a salon owner, an antiques dealer, a Harvard Law School-educated arbitrator and someone who looked unnervingly like Mr Rumbold from Are You Being Served. Many had driven from Cape Town, even as far as Simons Town, just for this occasion. The menu was a set three courses by Sebastian’s wife, Nici. A real family affair then, though Nici happens to be a professional chef and co-owner of Zest Catering. As the wine flowed copiously so too did the conversation. There was a general cheerful feeling that Bot River was the place to be right at that very moment, if not for ever. I for one started happily considering the possibilities. To live in Bot River forever… on the farm of course, complete with Nici to feed us, Sebastian to supply us with wine, and Jayne to look after us… what more could anyone wish for? One way or another we’ll be back. There’s the Bot River Spring Riviera next weekend, the next barrel cellar lunch on 25 September and the Elgin Open Gardens, which includes Jayne’s little slice of heaven, on 29 and 30 October and 5 and 6 November. See you there. Daisy and her family were guests of the Beaumont family and stayed in the Old Mill, one of two self-catering cottages on the farm. 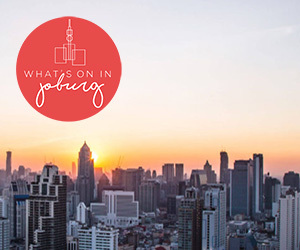 For more events in Bot River, keep an eye on WhatsoninCapeTown. A wonderful article and description of the Beaumont family and wine farm. All absolutely true. You must visit !